The Echinoblog: What are the FASTEST known Starfish?? What are the FASTEST known Starfish?? thanks to WildSingapore for their Astropecten pic! What is the FASTEST known starfish?? People are always interested in the upper limits of our world. The biggest! The smallest! The most dangerous! Where echinoderms are concerned, I've tried to answer a few of these. The biggest starfish can be found here. The largest brittle stars found here. So, this week a new open access paper by E.M. Montgomery and A.R. Palmer in the Biological Bulletin looks at locomotion in the bat star, Patiria miniata but provides a very handy dandy comparison of movement rates in several well-known sea star species (the paper itself we shall discuss another day....). It should be noted that most of the rates outlined below are based on a clip motivated by predators. So, its not necessarily clear what their "average cruising speed" would be..
Sea Star movement rates vary from 0.3 mm/s (milimeters per second) in the "sun star" Crossaster papposus to a breathtaking 50 mm/s!!! Most of the observed species (which are intertidal-shallow species like Patiria miniata or Leptasterias) seem to run on the slow to moderate side, about 0.3 to 1.3/2.0 mm/s and are medium-sized but relatively few of the smallest or largest species were included. Diversity isn't well sampled and we really only know the movement rates of VERY few species (17 out of 1900 species!). Its thought that larger size does have some relationship to speed and some of the fastest species listed are also among the largest.. Here's a breakdown of speeds in starfish in milimeters per second! Astropecten is the "proper" sand star. They occur on unconsolidated sand/sediments where they sit and wait, buried until prey comes along. They occur in shallow-water, tropical to temperate water habitats all over the world. There are many species..many of which are deceptively fast...Here is a nice video of A. aranaceus which is found primarily in European waters.. But here is Astropecten polyacanthus from the tropical Indo-Pacific. Look at that thing go! These two species are the most commonly encountered in the North Atlantic-so on the east coast of the United States and in Europe. These are the classically known "starfish prey on a bivalve" type of starfish that you see in the intertidal. Here's video from Massachusetts showing Asterias moving around at a decent but relatively slow clip.. 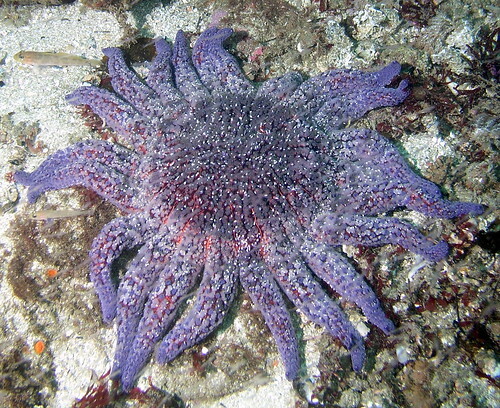 This species is the well-known "cushion star" found in the tropical Atlantic-Gulf of Mexico, Bahamas, etc. Its primarily an opportunistic omnivore feeding on algae and other organics present on the bottoms. TOP FIVE FASTEST KNOWN Starfish! This is the well-known "Chocolate Chip Starfish" that occurs in the tropical Indo-Pacific. This species is often encountered in the aquarium and tropical tourist trade. It is related to the "Cushion star" O. reticulatus above..and similarly, feeds on microalgae and lives on loose, sandy bottoms. The video doesn't show them at their quickest but its something.. This is the infamous Crown of Thorns Starfish which occurs throughout the tropical Indo-Pacific from Hawaii and Baja California all the way to the east coast of Africa in the Indian Ocean. Its a large, fast, coral eating predator..
3. Archaster typicus (Archasteridae). Speed: 12.7 mm/s (deviation +/- 5.4) Here's one that a lot of people probably don't realize. This is the "fake Astropecten". I outlined a blog awhile bag about how to distinguish it from "proper" Astropecten here. Archaster is parallel/convergent with Astropecten (below) but live in a similar habitat buried or semi-buried in loose sediment/gravel...There's a nice account of biology here by my friends at Wild Singapore..
Pycnopodia is found only on the west coast of the United States from Alaska to southern California. Its a big animal-up to about 2-3 feet in diameter. here's some footage of this formidable species in motion! 1. Luidia ciliaris and friends (Luidiidae). Speed: 50 mm/s !! 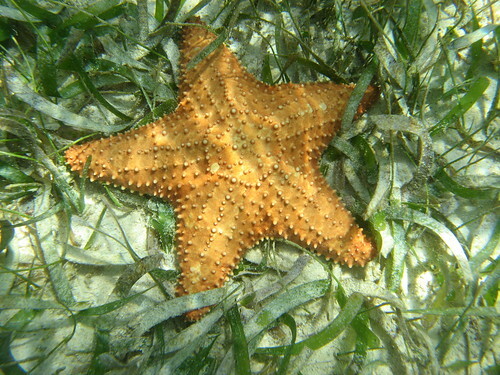 Luidia is a genus of "sand star" that lives in tropical to temperate, usually shallow sandy habitats all over the world. They are predators that feed on mollusks, sea urchins and other invertebrates. L. ciliaris occurs in the North Atlantic around Europe-the UK and so thereabouts.. So, not what you thought! Pycnopodia has gotten the reputation as the "fastest starfish" in the world. But NOT so! It would seem that Luidia spp. overall seem to be among the fastest of sea stars with a rate of movement just short of twice as fast as Pycnopodia! Diver and photographer Neil McDaniel (who has contributed to the Echinoblog before) has graciously tested movement rates and found that under duress Luidia foliolata is about 25% faster than Pycnopodia. Luidia foliolata travels at a rate of about 46 mm/sec vs. about 35 mm/sec in Pycnopodia. Perhaps something to do with living primarily on sandy sediments?? Here's Luidia maculata from Lembeh (Indonesia). Note however, that this one has some commensal crabs that seem to be in on the action.. Even the 5-armed species are pretty light on their tube feet... Luidia clathrata from Isle of Palms, South Carolina..
Starfish from paul zoeller on Vimeo. Thanks to Neil McDaniel for his contribution to this account! Wow, those comparison so great. Sir, what's the metodology to measure the seastar speed? The methodology for the bat stars is listed in the open access paper which is linked in the post. The others likely have heterogeneous methods given they are gathered over the course of several years. Is this a function of substrate types too? I mean, sand and mud are unconsolidated and sea stars that are adapted to it don't even have to cling for dear life, unlike most of those that live on hard substrates (esp. those that live in high-current/wave action zones). That said, Pycnopodia and Asterias are exceptions. Indeed so! There are different kinds of tube feet and different kinds of functional adaptations. And as I said in the blog, there's actually a huge undersampling here. Most of the animals featured are probably present because they are familiar and easy to observe. MANY more factors-environment, functional morphology and even phylogenetic constraints are likely at play. GREAT question! Thanks, "asterias" (ChrisM ? ), for giving its proper name to my philipino starfish on Yutube. I'm only an "autodidacte naturalist". I discover your site. So many things I have to learn from here ! yes. that was me. glad to have helped and happy that you find my blog useful! How fast are brittle stars compared to these starfish? Its generally harder to measure two different taxa for speed. 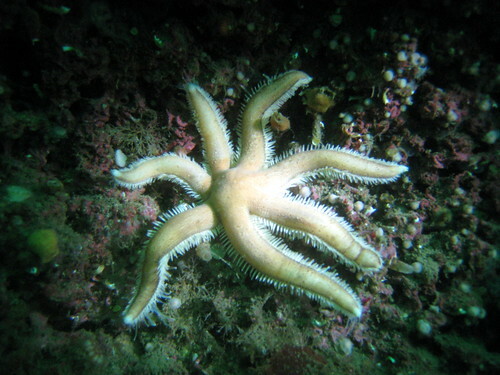 Starfish have a coordinated tube foot wave motion vs. brittle stars which mainly scuttle across the bottom. I would say that brittle stars are slower on the whole though. Drop and Roll! Sea Urchin ESCAPE Behavior!